Yesterday, at Winchester School Garden Club, we made room for new plants & seeds by clearing out a lot of extra red orach (mountain spinach). I got to take some home - yummy steamed, tastes rather like beet greens, stems seem tough at first, but aren't. Beautiful and useful - I learned about this from someone who stopped by the Women's Art Assoc. of Canada library, where I was volunteering during Open Doors yesterday. Four Directions Teachings.com - Aboriginal Online Teachings and Resource Centre - © 2006 All Rights. Occasionally, I still recommend Thomas Walkom's 1994 book, 'Rae Days: The Rise and Follies of the NDP'. The Toronto Public Library has lots of copies; it's likely available easily elsewhere, too. Following up on my question about whether any org these days accepts donations of cancelled stamps - thanks to another Toronto Raging Granny, who sent me in this direction. "Turtles all the way down"-the Wikipedia article ignores the Native North American origin of this creation story, even tho' its final reference is to this lecture series. Last lecture: while land claims litigation remains unsettled, laws defining Status Indians shrink those numbers, so who will benefit? The truth about stories a native narrative : King,. This has been on my desk since winter, makes me smile every time I find it. She succeeded in getting the CD she needed back from the monkey who took it by tossing a banana at the monkey, credits her success to her experience on the Ed Sox softball team. It used to be possible to donate cancelled stamps from snailmail that came in - some charities collected them. Then snailmail & stamps kinda slacked off. Now nice stamps are coming thru again. Anyone know anything productive to do with them? On the weekend, planted my big balcony pot with a lot of calendula seeds from Green Thumbs Growing Kids - I never plant all seeds, just in case. Also put in last year's cuttings of both ivies and the small-leaf coleus (kept in water since last summer), and a few of the seeds last year's Oxfam sunflowers grew, left over from those I dried, then sprouted in the winter. Our water barometer predicted this aft's intense storm - 12 or so hours before the storm, the spout dripped. The photo shows that now the levels in the spout & the bottle are close, meaning fine weather for the next 12-24 hours. Was our meeting very productive > even tho' < a couple of the people expected didn't come, or > because < a couple of the people expected didn't come? Meeting yesterday reconfirmed: more legal & actual need for affordable & assisted housing, yet no matching increase in appropriate, available housing, means trouble. This has been going on too long. Back in T.O. now, after family visit. On the return trip, was served breakfast in the dark, saw a mini-squash, cut off a piece, looking forward to the crunch of the skin and the feel of the tiny seeds in my mouth. Yikes! It was a nasty-flavoured sausage! Gotta be more careful. is heading out in a little while for the Kolter Bouchard Show, Ryerson online - ckln.fm. heard the wedding vows live on the radio this morning, is happy for young love! May 14, Java Jive (Church/Isabella), a heartwarming event - please attend. Here's a quick (2-3 min.) tour, showcasing some of our riding's wonderful variety, while highlighting some Green Party platform points. The video ends with an overview of my Community Democracy Ambassadors plan for Toronto Centre. It's time ... vote Green in Toronto Centre! Will be talking about Green Party policies with Wayne Baxter on his AM740 radio program, Right on the Money, about 45 minutes from now. Tune in. Shameless promotion - our Toronto Centre Green Party of Ontario candidate, Mark Daye, organizes one of these excellent evenings every month. He's made this month's, tonight, a fundraiser for my campaign - thanks, Mark. I'll be there, and I'm very much looking forward to getting together with everyone else attending. Electoral reform: Canada can catch up to almost all the other parliamentary democracies all over the world. Proof Studio Gallery, Distillery District, Studio 104, Case Goods Warehouse, Building 74, 55 Mill Street, Wed.-Sun.12-6, and I understand the artist will be there today. Full house for The 519's exciting debate yesterday evening, moderated brilliantly by Jane Farrow - candidates Susan Wallace and Bahman Yazdanfar, not in the photo, also participated. Thanks, 519 folks, and all involved. Amnesty International's reflective summary of the answers they received to questions asked of our 5 main political parties - a worthwhile read - the 4 parties that responded provided lots of significant specifics on 6 key issues. Lots of relevance to Toronto here: we need safe, nutritious, locally-produced food. More and more people are looking for organic. Let's stop subsidizing agrochemicals and foster sustainable food. I just voted. You can, too. Our kalanchoe is blooming again - good sign for May 2. We've a big variety of campaign buttons for you to choose among, at our office, 125 Lower Jarvis Street, right by the St. Lawrence Market. We're open 10am-8pm every day. Signs and info are also available. Please stop by. Rally for Democracy yesterday:Thea & her son show what's at stake. Please attend this important event: 7pm, Sandford Fleming Building, Room #1101, University of Toronto (10 King's College Rd., north off College, west of University). 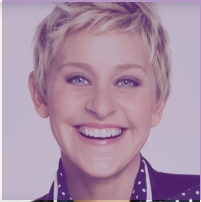 This is a campaign to make Ellen the unanimous write in candidate for the 2016 Presidential election!